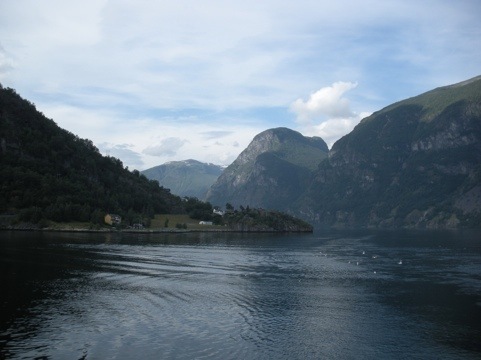 Day 5: Have you taken a fjord ride lately? We slept well and set out for a 9am fjord boat ride. The day was cool and a little overcast, but the combination of the water and the mountains was awesome (literally). It was 2 hours from Flam to Gudvangen, navigating the Aurlandsfjorden and the Naeroyfjorden ( there will not be a quiz on any Norweigan). We got off the boat to get a drink, then back on for the same trip but in reverse. 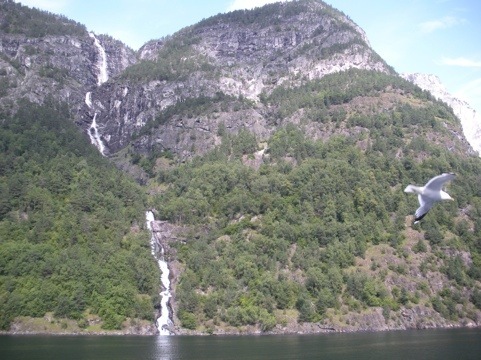 After a quick stop at the market in Flam for a few things for lunch, we then started the 3 hour ride from Flam to Bergen. We stayed on E16 the whole way, but speed limits are slow, varying only from 60 kph to 80kph. And there were a lot of mountains to drive through, son again we spent a lot of time in tunnels. 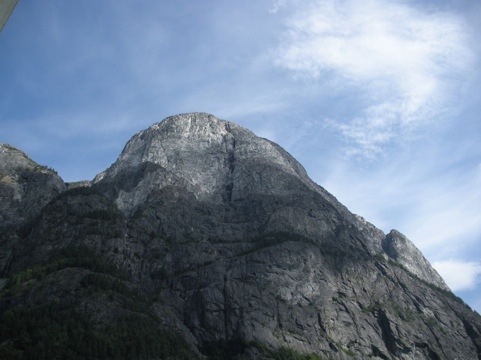 After checking in at the Radisson Blu Norge, we set out to get our bearings in Bergen. Almost immediately in front of our hotel was what seems to be the single 22 July memorial. 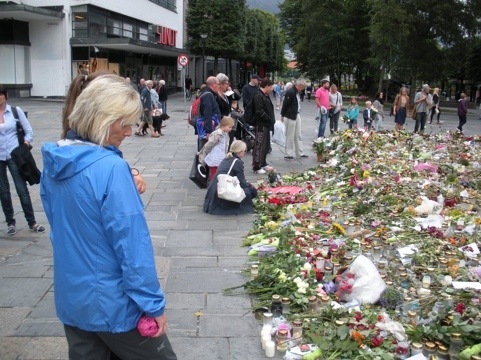 Similar to Oslo, there were flowers, candles and notes. Here we are 11 days after the attacks, and the sense of stunned grief is still strong. We found the tourist office, and bought Bergen 48 hour passes to cover the museums and public transportation. We found a great restaurant, Naboen, just a couple blocks from the hotel. We both had salmon in a mustard and dill sauce, it was delicious. Tomorrow we’ll start doing the sites in Bergen. We can already tell it has a different (younger, open later) vibe than Oslo.